"Variations sculpture 1981 by Bill Witt"
An image of the sculpture Variations on a Theme on the campus of the University of Northern Iowa in Cedar Falls, Iowa. 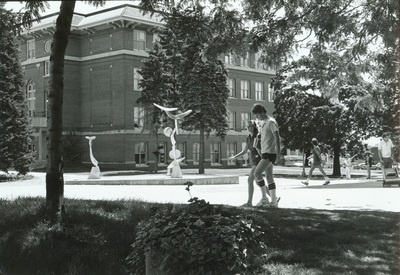 The sculpture by Robert A. Lorr was installed in the plaza between Seerley Hall and McCollum Science Hall in 1975. The sculpture was removed then re-installed, so the setting looks very different now. The medium is stainless steel. "Variations sculpture 1981 by Bill Witt" (2019). Art on Campus Photographs. 6.